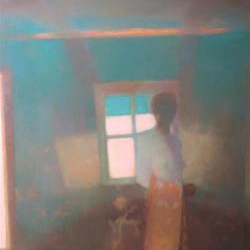 Debra Birmingham is a painter who creates enigmatic, lyrical landscapes and still lives. Her work is influenced by the fine line of an image from memory and an image from a dream. Birmingham attended the University of Washington and Cornell University. She has taught at Hunter Museum of Art, Cornell University, Hobart College, Ithaca College, and the University of Washington.